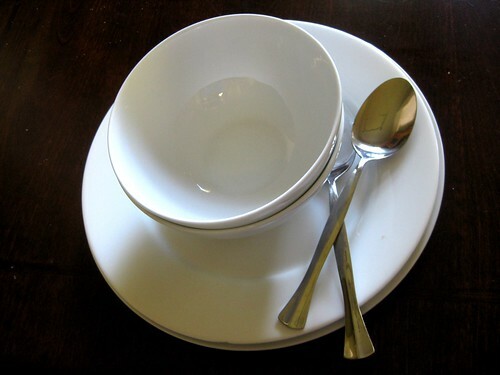 Faithful readers and home cooks: thank you for taking the time to read my blog. Sometimes blogging is like exercise. You know you will feel better when you finish, but some days are more challenging to write than others. So essentially, it's a long way of saying: THANK YOU. I may cook for the people around my table, but YOU, out there, are the reason I write about it. In-n-Out, favorite local pizza place, best cup of coffee ever, most enjoyable Pinot Noir... I could go on. We'll dabble, try new things, play along with someone else's favorite- but let's be honest: it doesn't compare to your standard. It's how we feel about Sushi. I can enjoy a mid-night sushi bar just like anyone else, but it's always a "B" compared to Mikuni, a small Sacramento chain that will soon sweep the nation. They just opened a new location in Vegas (aspiring dining city). See? I'm not just making this up! Even Vegas wants them! We love their sushi, but we also love their "Freaky Edamame." It's a perfectly spiced appetizer to wet your palate for a few sushi rolls. I've been resorting to their "non-raw" rolls since the baby news, but it's been good to try new things. Good thing edamame is not forbidden for pregnancy. I could eat these little green guys by the handful. I love recycled leftovers. Sometimes it takes a little creativity, but this is as easy as it gets folks! 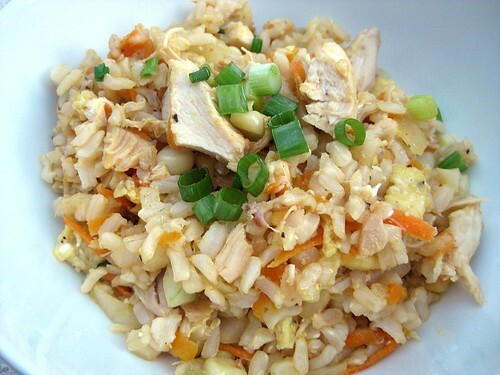 Chicken fried rice: no rules, tasty, fast and saves well. Feel free to add what sounds good to you. 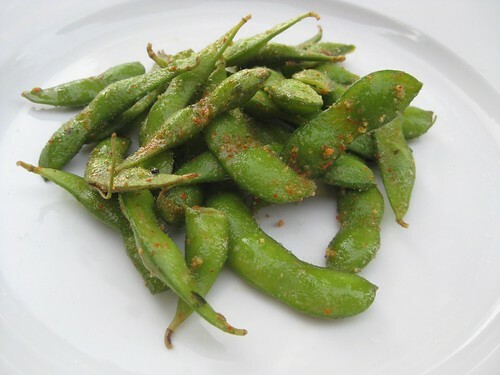 Pees, edamame, bell pepper, beans- this recipe is just to get you started. Okay, so I'm on a bit of a kick this week: Sweet potato soup, Sweet potato hash, Roasted sweet potato... all because I bought a ton of sweet potatoes in preparation to make THIS dish. Last Thanksgiving we were invited to our neighbor's Thanksgiving gathering. It was potluck style (food and people) every different kind of dish and walk of life... that's Portland for ya. 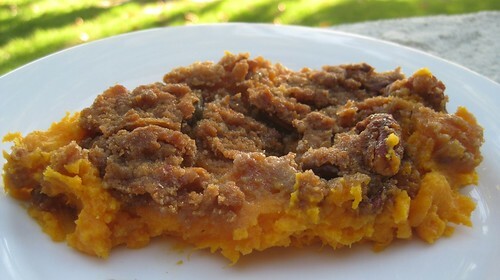 To be honest, I don't even remember what I brought, but what I do remember was this sweet potato dish. I shamelessly scraped the last of this dish when it came through the second time. If I hadn't been in the presence of strangers I might have licked it clean, maybe I should have anyway. I sheepishly asked the next day if I could find out who made it and stalk them for the recipe. She said it was her chef brother (of course). I thought it tasted chefly. Some side dishes I could take or leave. This is one you will not want to leave till it's GONE. 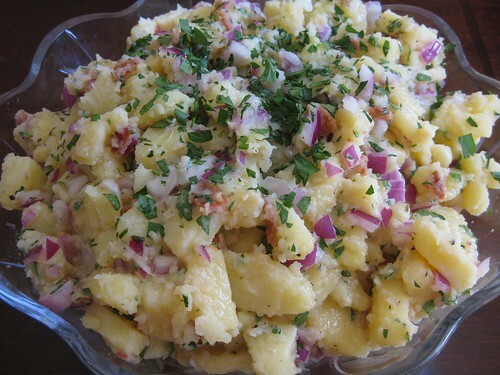 It's more savory than your typical German potato salad, which is why I like it. The vinegar and the sweet red onion make this dish a hit. I'm so glad A Feast For The Eyes finally decided to share her family's heirloom treasure. The recipe is straight from Debby's Mutti, German for mother, who grew up in Bavaria. We had a few students who were embarking on a year abroad in Germany a few months back. While they were probably gonna get sick of meat and potatoes, I decided it was a good excuse to do some German cooking! Caleb and Charlene, we love and miss you! With a married name like Ritter, I figured I needed to branch into some German cooking. No wonder Chris is such a meat and potatoes guy. Let it be said, I married into the name, I like my lighter sides as a rule. But this one hit the spot. I felt like Chris' Grandfather Fred would be proud... as he is always recounting his German ways and reciting German phrases he knows by heart.